Ok, here it is, the OCC and planning topic for my Heart of Darkness inspired RP. Hopefully this thing will fly but if it doesn't well at least I tried something. The layout will basically be the same here as it was for the Medieval and Superpower RP's, with a complete information station with helpful links to the whole RP. It will also contain links to the beginning of the story arcs, helpful summaries of said arcs, a general summery of the story up to a certain point, and finally character posts and information. So, now I will talk about the contents of the RP. Overall, this RP is your basic good ol' War RP, with tanks, planes, trash talking soldiers, and huge exploding tracts of jungle as far as the eye can see as well as a good helping of mystery, dark humor, and international intrigue thrown in for good measure. Think the action of Full Metal Jacket mixed with internationalism of the UN and the horror and chaos of Apocalypse Now and you will get a good idea for this RP's intent and content. Thus, while I have tried my best to make this RP as open to change as it possibly can be, keep in mind that the RP intent of the itself is to be very graphic, very actiony, and overall very dark in nature, so don't expect this RP to filled completely with sunshine and lollipops. Expect blood, gore, violent deaths, and all the other nasty things that go into making a good war story. 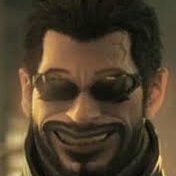 Still, despite the violence and horror, the overall objective of this RP is entertainment for it's players so don't be afraid to have fun with it. It's ok to be a bit outlandish or kinda silly, just keep it within some level of realism and believability and it should be alright. Also don't forget to check out the the RP creation guide and the guidelines for Roleplaying for both the basic RP rules and the helpful pointers it gives. Lastly, be keen to note that I (and hopefully a number of more RP experienced helpers in time) will be running the overall course of RP, due to it's complex nature and overall difficulty in effectively planning a coherent story based on the subject matter. Despite this fact, I still want to leave the door open for suggestions and other things of that nature. If you want anything added or taken out, or simply don't like the way things are going just post a comment here or PM me. I will try to adapt the overall plan to suit the characters and the developing plot. Don't worry about everything else, I'm sure you can handle that. The form for this RP will be as follows. Now that the basics are down, let's get this party started shall we? More details will come in the coming days and weeks. Thanks for your time and god speed! Looks really solid man! I'm not good to write a bio at the moment but I'll have something up by tomorrow. Oh hey, one thing. For the way you're going to be running the RP... just stick with a kind of board of directors set up. Everyone has their one vote and usually the people that want very little to do with the management end up settling down toward the bottom of the tank. I suggest role as well. There are distinct differences between riflemen, etc. Cantar Conejo, foggy and cloudy night. Meeting at the Shack by the River. Mission covers all of North Altomesa into southern Cameroon. ~: Currently Inactive, but will come up in the RP again eventually. *lines through the name*: Indefinitely Inactive, either due to RP death, dropping out, or inactivity. RP Status: Up and Running. The year is 1969 and once again the battle between Capitalism and Communism rages on in the third world. The Soviet Union, looking to expand their influence and make political inroads in Africa, begins to fund a small group of communist rebels in the small nation of Altomesa. Located on the African Coast between Nigeria and Cameroon, Altomesa was a Spanish colony about the size of present day Portugal who gained their independence from Spain in 1964. The nation that emerged from the ousting of the Spanish, the Democratic Republic of Altomesa, was weak, both politically and financially. Just a year after the nation was founded Communist rebels, armed with Soviet supplied weapons, seized the city of Santa Felipe in the nations interior from the military forces stationed there and declared themselves an independent Communist State. 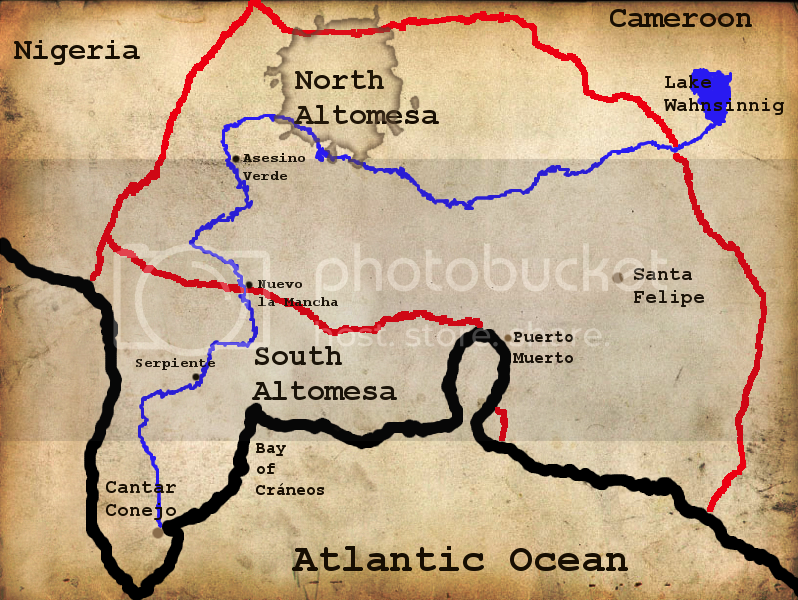 Spreading from Santa Felipe, the Communists easily defeated the Southern Altomesa's military forces and within six months control nearly all the northern part of the country. The Southern Altomesa government, desperate for help in saving their nation from the spread of Communism, turned to the U.S. for aid. Recognizing the political importance of the nation because of it's close proximity to Nigeria and Cameroon, the U.S. immediately began to send arms, equipment, and troops in to bolster the defenses of Southern Altomesa. Eventually the number of U.S. troops involved in the war reached unprecedented levels, with an overall force of about 200 thousand men located throughout the small country. Despite these massive reinforcements the North continued to push forward with breakneck speed, thanks largely to the help of African Mercenaries hired to provide much needed training and support for the North's Guerrilla forces. In 1968 though the advanced was finally stopped and the battle lines between to two nations materialized. From that point onward neither side could get a clear advantage over the other and the conflict devolved into a bloody stalemate, with both sides taking dramatic and appalling loses. At this point in the conflict, the battle could go either way and truly the war between the two countries is just waiting for a chance to explode into a full scale war of attrition. Also, what time period is it? Some of the technology soon to be in use by the US and NATO is like god mode in a video game. Oh, and dibs on the medic. Will post bio soon. I wouldn't post anything yet. I'm still working a little bit on the back story. For all you know, this might be set in South America or Afghanistan. Wait till tomorrow when it's good and ready. I'm very interested in this, especially since I'm been reading a lot of books on mercenaries lately. You have my Stoner 63 LMG. As a bonus, it finally give me a good reason to post this, as opposed to doing it randomly as I have been wanting to do. Your character's letter never would have made it past the wartime censors, Andrew. Cool beans all around though! Very interesting. I'm waiting on someone else to post a bio so I get an idea of what to shoot for, but you can most likley count me in. I've got alot of projects due soon and therefore alot of procrastination to squeeze in. I've already got mine pretty much figured out. Bio: Randal Veers had a fairly mundane childhood in the heartland. He went to school and made the grade (barely), played stick ball with his friends, worked on the farm, and made love to his girlfriend. When hostilities broke out Randal was quick to join the service. He went for the Army because their recruiter got to him first. After his romp through boot camp and a few years on the front lines, Randal finally made officer. With slightly fewer bullets to dodge and shiny new bar, Randal decided that he had to aim for the top. It has been several months since his promotion and so far he hasn't fouled up too badly. With any luck, Randal hopes to be made Captain sooner rather than later. Strength: Years spent working on the farm has honed Randal's body to near-peak condition. Those cow patties don't move themselves! Cartographer: Randal has always had a thing for maps. He is proficient at mapping areas on paper and keeping track of locations in his mind. Without this skill Randall would still be a grunt out on the front lines... or dead. Bio: Jacob was born into an average family in the American East. He had a relatively privileged youth, thanks in large part to his rich aunt, and spent his childhood mostly in exclusive boys school's and academies, excelling at public speaking and philosophy. Despite his pampered upbringing and general loftiness of thinking, he developed throughout his school years a good ability to lead people as well as a strong sense of patriotism. This privileged life ended abruptly after his collage years after, when he decided to get engaged to a woman named Molly, his aunt disowned him of her funds. Broke and without any sort of cash Jacob decided the best thing he could do was to join the army. He volunteered for duty at the age of 25 and for a time was simply on standby at his local army base, drilling with his fellow soldiers and gradually making his way through the ranks. He eventually singled out from his company for officer training by the bases colonial, who admired Jacob's leadership ability and his proud patriotism. He was already a Captain by the time the war started and he once again volunteered to be with one of the first strike groups going into Altomesa. He has remained on the front lines, fighting and killing, ever since. Natural Leader: Through years of public speaking classes and developing his own natural charisma, Jacob has become a sort of leader of men. While he isn't any Patton or Eisenhower, he still is a leader to look up to and has skillfully built up his persona as well as a small cult of personality. Experienced Tactician: Over the four years he has spent in Altomesa, Jacob has learned many tactics and methods of combating the enemy, helping to save the lives of his troops and earn him much fame and renown. He has already been recognized twice for his tactical prowess, the first time at the beach landing at east side of the Agua Straits, the second time at the battle of Crazy Back Swamp, both of which resulted in a resounding enemy route and minimal US casualties. When I was researching some things for my bio I encountered a problem. Player rank is inherent in this RP's design... some people are going to be able to order others around. Most of the time that is very bad for an RP's health. How do you propose we get around that?